Spanish designer Nacho Carbonell sees objects as communicating living organisms that spark up new sensations and people’s imagination. His latest venture, Communication Line, is a public bench created for Dutch Design Week located right in front of Eindhoven’s central cathedral. 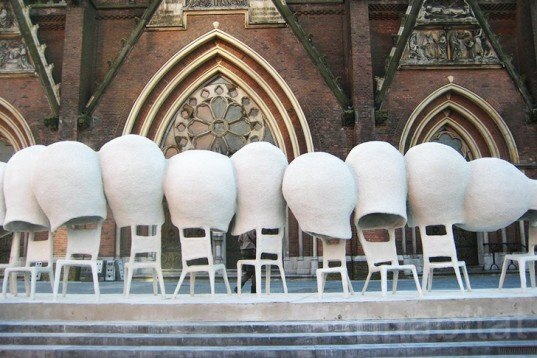 The aim of this quirky collection of interconnected chairs – with attached cocoons – is to help people socialize and to promote playful dialogue. 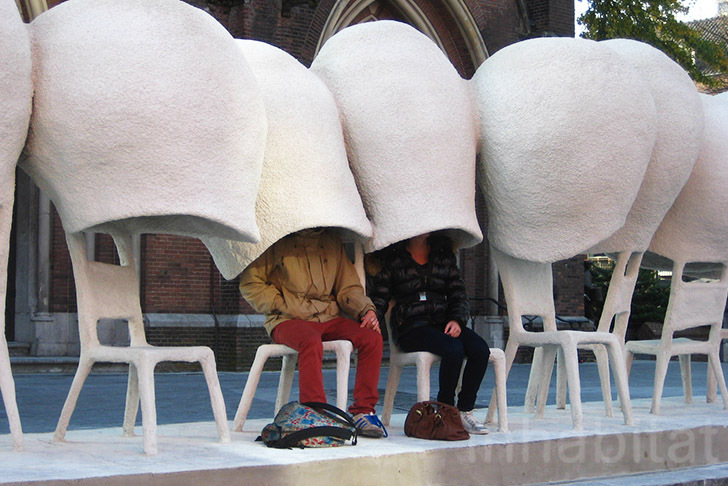 Sitting at the main entrance of Eindhoven’s Katrina Kerk cathedral (chosen because churches are strong symbols of communicating and transmitting messages to millions of people) Carbonell’s social bench acts as a tool for communication. This new project seems to be a continuation of the designer’s 2009 work, Evolution Collection, but instead of providing a space for personal thinking and hiding from the world, this interactive installation was designed for bringing people closer. Carbonell’s Communication Line is made by molding chicken wire and covering it with recycled paper and sprayed on cement. Each of the chairs’ cocoons are connected by a hole, from one edge to the other, making it also perfect for ‘Chinese Whispers’. A fantastic piece of public furniture, Carbonell’s Communication Line allows you to escape everyday life and reconnect with your local people. Sitting at the main entrance of Eindhoven’s Katrina Kerk cathedral (chosen because churches are strong symbols of communicating and transmitting messages to millions of people) Carbonell’s social bench acts as a tool for communication. This new project seems to be a continuation of the designer's 2009 work, Evolution Collection. But instead of providing a space for personal thinking and hiding from the world, this interactive installation was designed for bringing people closer. A space for taking funny pictures. A space for playing with kids. Carbonell’s Communication Line is made by molding chicken wire and covering it with recycled paper and sprayed on cement. Each of the chairs’ cocoons are connected by a hole, from one edge to the other, making it also perfect for ‘Chinese Whispers’. Detail shot of the connection. Sitting at the main entrance of Eindhoven’s Katrina Kerk cathedral (chosen because churches are strong symbols of communicating and transmitting messages to millions of people) Carbonell’s social bench acts as a tool for communication. This new project seems to be a continuation of the designer's 2009 work, Evolution Collection, but instead of providing a space for personal thinking and hiding from the world, this interactive installation was designed for bringing people closer.